On the nose the wine is entering its secondary phase, with hints of nutmeg and clove backing up the black fruit. The palate is still dense, firm and concentrated, with wonderful acidity, lifted in the best sense, and a powerful substratum of tannin. The kernel of dark fruit is embroidered by notes of dark chocolate and cloves. The finish is long...I wrote broad shoulders yet disciplined structure, by which I think I meant that this is a very serious wine, with a capacity to evolve further. The Wine Advocate - The dark ruby/purple-colored 1996 Pagos Viejos (400 six packs available for the United States) is a fabulous Rioja. 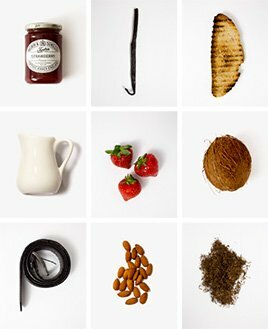 It boasts a complex bouquet of lead pencil, red as well as black currants, spice box, cedar, and tobacco. Made from low yields, the wine displays a gorgeous mid-palate, great depth and purity, and a finish that lingers for nearly 40 seconds. Drink this spectacular effort over the next 15-25 years. Juan Carlos López de Lacalle, owner and winemaker of Artadi, is recognised as one of the greatest names in the business in Spain. The winery was once a co-operative of 13 growers who owned well-sited vineyards around the town of Laguardia in the Alavesa wine region of Rioja. Juan Carlos saw the potential of these wonderful vineyards and purchased the Bodega, immediately amending the philosophy and style of winemaking. The winemaking is modern with an emphasis upon fruit driven wines, characterised by the terroir of individual vineyard sites – a far cry from the philosophy of traditional Rioja producers. French oak is used, not American, allowing the principle variety, Tempranillo, eloquent natural expression. From the 2 hectare El Pison vineyard, the vines of which were planted in 1945, all the way through to his properties in Alicante and Navarra, he is both a punctilious and gifted craftsman. 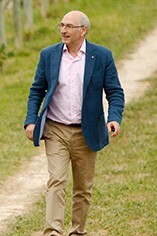 Mastery of Monastrell and Garnacha has now been added to his acknowledged and alchemical gifts with Tempranillo; attention to detail is evidenced at all stages of the process, from the pruning in the vineyard to the six additional sorting trays in the winery, then a fermentation in especially designed vats to ensure an optimum extraction of fruit and tannin. The results are completely outstanding. Vinas De Gain comes from vines of over 25 years of age and it is a suberb quality wine, 100% Tempranillo from fruit grown at high altitude vineyards in Rioja Alavesa. 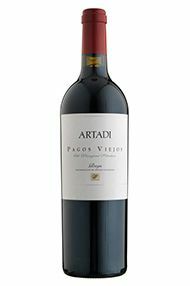 It is the least expensive offering in Artadi's range, yet it displays impressive purity with layers of flavours reminiscent of Burgundian complexity. Artadi produces exemplary unoaked and oaked Riojas, including superb Reservas and single-vineyard wines such as the Viña El Pison. A deluxe cuvée Gran Reserva, Grandes Añadas, was produced for the first time in 1994. His Navarran Bodega is located in the village of Santa Cruz, using 100% Grenache from 100-year-old vines. As Navarra continues to emerge from the shadows of its illustrious neighbour Rioja, the wines of Artadi are helping us to understand its quality and identity.